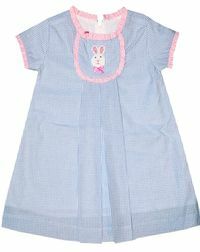 We just love this adorable light blue seersucker dress for baby and toddler girls with it's little bunny rabbit embroidered tab! 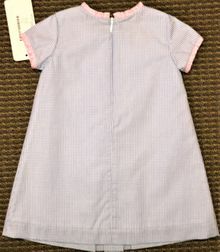 The neck, tab and sleeves have light pink ruffles. The little bunny rabbit is hand crocheted and has a pink bow. 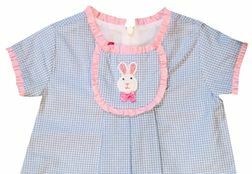 Perfect for Easter egg hunts, parties and other Easter occasions!